World Dryer K-162P SMARTdri Plus Automatic Operation, Surface Mounted, Black Aluminum Hand Dryer, with single-port nozzle. This Smartdri Plus automatic black hand dryer is one of the best hand driers currently available on the market! Does your aluminum hand dryer have an HEAT ON/OFF switch, with 3-speed settings? SMARTdri Plus is the most energy efficient, best of the best hand dryer, and fastest hygienic hand dryer. World Dryer SMARTdri Plus K-162P bathroom hand dryer is designed to optimize dry time, energy consumption and sound quality. The intelligent, flexible controls allow customizing of air flow, sound quality and heating options to fit any application environments. The World Dryer Smartdri Plus hand dryers have a cover constructed of either die-cast aluminum finished with epoxy paint or chrome plating; cold rolled steel finished with epoxy paint; stainless steel with a polished (bright) or brushed (satin) finish or cast iron with porcelain enamel finish. The wall mounting plate is constructed of die-cast aluminum and the nozzle is constructed of die-cast zinc alloy finished in either bright chrome or nickel plating. Epoxy painted covers and motor enclosure incorporates SteriTouch antimicrobial technology. The cover is attached to the wall mounting plate with tamper-proof screws. The motor is a thermally-protected universal brush type motor operating at 23,400 RPM and delivering 100 CFM air flow at a velocity of 265 MPH (23,320 LFM). The Smart dry Plus Hand Dryer incorporates a 400 watt heating element constructed of Nichrome wire and protected by an automatic resetting thermal cutoff. This newest commercial hand dryer activates by an automatic infrared sensor with a 3 second run-on time and 30 second vandal shut-off. A control board contains a motor control switch which can be controlled in either Hi, MED and LOW power settings. The control board also contains a heater control switch which can be controlled in either ON or OFF position. The Smartdry Plus hand dryer shall provides a 41°F temperature rise. 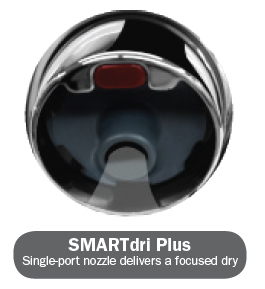 Additionally, the Smartdri + has an ingress protection rating IP24. World Dryer SMARTdri Plus K-162P bathroom hand dryers require a dedicated 15 AMP circuit, and must be properly grounded. GFI circuit protection is recommended. One side of dryer should be mounted to a stud. HandDryerSupply.com has the best price on hand driers like the black K-162P SMARTdri Plus aluminum hand dryer by World Dryer. Get Free Shipping on the Black K-162P Smart dri Plus hand dryer and all orders over $155. Select "Free Shipping" at checkout. Sent via UPS Ground. US Domestic orders only. Need it sooner? Other options are also available.